Here are a few questions that come up pretty frequently about and during 24in48. Any that I missed? Leave a comment and I’ll add your questions to this list. How does 24 in 48 work? Do I have to read 24 books in 48 hours? When is the next readathon? What time does the readathon start? What if I don’t live in the Eastern timezone? Where can I find a full list of participants? Do I have to read for a full 24 hours? How should I track my hours? Do ebooks or audiobooks count? Can I read for charity? Can I read whatever books I want? Q: How does 24 in 48 work? Do I have to read 24 books in 48 hours? Q: When is the next readathon? A: Mark your calendar for January 26-27, 2019! Q: What time does the readathon start? A: The official start time is 12:01am ET on Saturday and the official stop time is 11:59pm ET on Sunday. Q: What if I don’t live in the Eastern timezone? A: You can do one of two things: you can do the readathon from midnight on Friday to midnight Sunday in your own local timezone, or you can stick to the official start and stop times, which will obviously be different for your timezone. For example, if you are in California, three hours behind New York, you can do midnight to midnight, Pacific time, which would be, 3am Saturday to 3am Monday, Eastern time. Or if you follow the official start time, your readathon would run from 9pm Friday night to 9pm Sunday night, Pacific time. Here’s a timezone calculator to help you figure it out. Basically it’s up to you. Because 48 hours is your whole weekend, you can do whatever works best for you. A: Yes! Check out the prize page to see what we’ve got so far. If you’d like to donate prizes (books, gift certificates, bookish stuff, etc.) please send an email to 24in48readathonofficial@gmail.com. Also, your donations through the PayPal Donate button over there in the sidebar help us to send prizes all over the world to our large international community. Please think about donating. Even $5 helps our whole community. A: Make sure you’ve signed up for the next readathon on the sign-up post, and include your main participation location and email. That location can be your own blog, Twitter, Facebook, Instagram, YouTube, Litsy, etc. but you also don’t have to have an internet presence to participate. You can just sign up and that’s it! You’re participating. But if you’d like to do more, you can use the hashtag #24in48 on all of those social media outlets to keep up with fellow readathon-ers, as well as check in to this blog as well as Twitter, Instagram, and Litsy during the ‘thon to take part in challenges, answer questions, and maybe win some stuff. Q: Where can I find a full list of participants? Q: Do I have to read for a full 24 hours? Q: How should I track my hours? A: There are lots of ways to stay on top of your hours. Some people use the stopwatch function on their phones to track the total hours read (just don’t hit Reset accidentally!). If you have a blog or Tumblr, etc., you can post updates periodically with your total hours, books, pages, read. But keeping track and posting updates is entirely up to you. I just ask that you’re honest in your counts when posting them here, especially as they might make you eligble for prizes. Q: Do ebooks or audiobooks count? Q: Can I read for charity? A: Absolutely! Every time we do this thing, at least a couple of people read for charity. They pledge based on the number of pages or books or hours read and donate money according to their reading goals. Need some ideas of charities? This list of literacy organizations is a good place to start, or do a Google search for literacy organizations in your area for giving back locally. Q: Can I read whatever books I want? A: Of course! Participants are encouraged to pick whatever books they want to read over the course of 24in48, across any length, medium, genre, you name it. 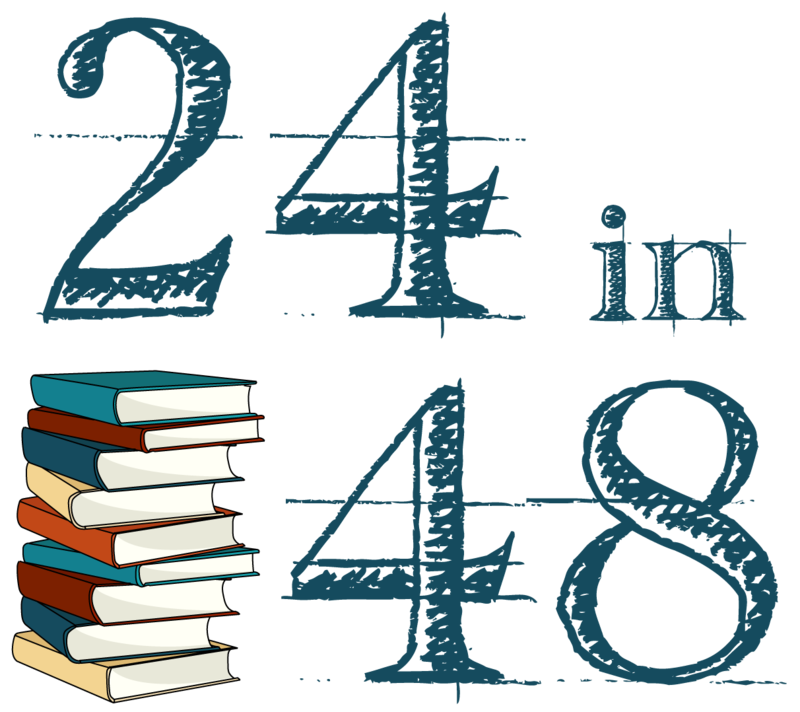 We are encouraging readers to think intentionally about the diversity of their reading for this event, but we do not require any particular book selections to participate in 24in48. great to know and helpful faqs – TY! Hi! I think the days here might be a bit off. If the readathon runs the 11th and 12th (Saturday and Sunday), doesn’t that mean it starts at 12:01 Saturday morning ET, not Friday? Ugh! You’re right, thank you! Fixing that now. Pingback: #24in48 Readathon Announcement & TBR! Are there restrictions on what genres of reading count? I’m wondering if reading scholarly articles for school counts… 😉 Or even newspaper articles, etc. You can read whatever you want! The next readathon is on Jan. 27-28, 2018. I hope you’ll join us then. Quick question, what if you’re traveling and changing time zones during the challenge? I’ll be going from Colorado to California. What’s the best way to determine my start and stop times? It’s entirely up to you. If you want to start in one time zone and end in another, that’s your call. Or you could follow it in real time against Eastern time. Hi, I’m from Indian Standard time, we are 10 hours and 30 minutes ahead of you. When do you suggest I start my readathon? I’m pretty confused myself! If you want to follow the official clock, you can start at midnight ET in the US on Saturday morning, which would be 10:30am on Saturday your time. Or you can start early and do midnight Saturday morning your time. It’s totally up to you! If I start at my time do you think it’s going to mess up since I’ll be starting off earlier or something? Nope, lots of people do the readathon in their own timezones. Just be aware that challenges and prize drawings are done according to the official clock. Can we add additional update forums after signing up? For instance I only signed up showing twitter – can I add a blog, Instagram, or others? For sure! Just make sure you update your original entry, don’t enter again.